Acroname's BrainStem technology is a foundational tool for bridging the gap between hardware and software systems. BrainStem controllers gather and relay peripheral information to other systems, which may be a host computer, additional microcontrollers or an array of sensors and testing equipment. The core BrainStem concept is metaphorically based on the human nervous system's data gathering, interpretation and transmitting processes. BrainStem modules are the ideal controllers for hierarchical control and autonomous systems. Using a robust networking protocol, BrainStem devices relay information across industry standardized interfaces such as serial, I2C, USB, Ethernet and BlueTooth. Each controller has an embedded virtual machine kernel that allows for rich and reactive embedded application execution, reflexive software creation and direct hardware access using a structured packet format. 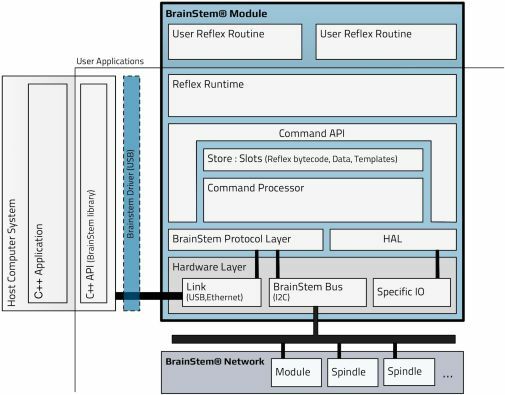 The BrainStem network can support more than 100 microcontrollers, and each microcontroller can have several subordinate networks of devices, sensors or interfaces. The BrainStem platform and associated APIs provide powerful computers easy access to sensors and actuators. Since these devices exist across such a wide application range, BrainStem modules are designed to be as generalized and adaptable as possible. This includes cross platform interface software, defining and publishing interconnect standards and protocols, selecting a common form factor and focusing on expandability. A high-level C-like programming language called Reflex, and the associated compiler, enables code to execute directly on-board the controller modules. The BrainStem Reflex system allows access to a soft real-time operating system. This type of system is ideal for those who have outgrown the "super-loop" type systems like Arduino. It allows for incredibly low power operation for battery operated and remote sensing applications. However, the elegant simplicity and C-like familiarity of the Reflex language makes low level microcontroller programming approachable; no more digging through thousands of pages of datasheets or wiring up expensive JTAG debuggers. The Reflex language allows for simple code to execute complex functions when triggered by external events, without getting bogged down in low level interrupt calls and microcontroller specific limitations. By utilizing BrainStem reflexes, a system can be remotely deployed and react intelligently to its environment. The embedded reflex program can collect and store information for later retrieval on the BrainStem's internal persistent memory or an external micro-SD card. Acroname's BrainStem platform and modules are heavily used in research environments including corporate labs, government labs, universities and K-12 institutions; it's also used by hobbyists and DYIers. More than 300,000 BrainStem based systems are permanently installed at OEM and contract manufacturing sites to enable mass production of consumer electronic devices. To enable robust, scalable, reconfigurable, reactive embedded systems, start your project with a BrainStem.